Elaine Ray is an award- winning journalist and fiction writer, who currently is pursuing a master of fine arts at the Iowa Writers’ Workshop. During her career, she has worked as a writer and editor for Essence magazine, an editorial writer for the Boston Globe and a communications leader at Stanford University. She is the winner of the 2016 Gival Press Short Story Award for Pidgin and holds an Online Certificate in Novel Writing from the Stanford University Continuing Studies Program. In 1990, she and her colleague Peggy Hernandez shared first prize for editorial writing from the Education Writers Association. In 1993 and 1995, respectively, Elaine won second prize and third prize, for editorial writing from the New England Associated Press News Executives Association. In 1995 she won a John S. Knight Journalism Fellowship at Stanford. Elaine has written freelance articles and columns for the Boston Globe, Essence, Black Enterprise, Modern Maturity, the San Jose Mercury News and the San Francisco Chronicle. 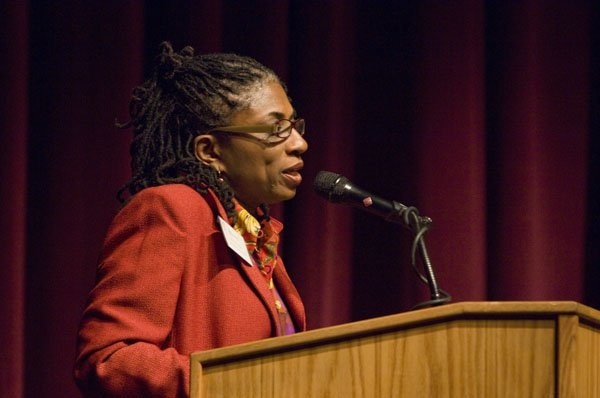 In 2005, Elaine joined forces with other Palo Alto Unified School District parents to found the Parent Network for Students of Color, an organization dedicated to advocating at all levels to create a climate of high expectations and academic achievement for all. She is a past president of the board of Foundation for a College Education. A native of Pittsburgh, PA, Elaine holds an M.A. in journalism from Kent State University and a B.A. from Chatham College. Her daughter, Zuri Adele, is an actress, who holds a master of fine arts from the UCLA School of Theater, Film and Television and a bachelor’s degree from Spelman College. Hi Elaine. I read that you became familiar with Frank Crosswaith during research on your father. I am eager to know more about your father. Frank Crosswaith was my maternal grandfather and I am researching his speeches and writings pertaining to the Socialist Party and the labor movement. I would be very interested in what you have learned about him. My name is Sumi Naidoo and I’m a writer at Columbia Graduate School of Journalism. I love your blog! I’m working on a project on one of the characters of the Harlem Renaissance that your father used to quite frequently write about and I was wondering if you wouldn’t mind speaking with me about him, if you have some time. My email address is sumnaidoo@gmail.com. Please let me know if you’d be up for a chat! This is very exciting. I love the way this blog has connected me with people like you. I would love to know more about your father. Thank you for sharing this. anglicanhistory.org/usa/misc/Durant_Ambrose/1946…………Hope we meet one day. My 16th formal picture in New York Age feb.1947. Christine, I would love to talk further. Hi cousin! I miss talking to you! I last called you to tell you about Uncle Jimmy’s death back in January. I hope you find as much pleasure as I have in researching your Ray history. My (about) tenth great grandmother was sent to barbados to get “seasoned” before she was sold to America. I believe she dad several children there. Anything you find out is emotionally rewarding, that it becomes a part of. Two questions; connected yet separate. The first question is whether or not I could send you a copy of my book, Fathers: A Literary Anthology? My hope is that you will like it enough to want to blog about it or otherwise bring it to the attention of friends and family. My second question is whether or not you would be willing to post a tribute to your father on the father tribute section of my website? If you visit the site you will see a couple of tributes that have already been posted. By the way, I am very much enjoying your site. I came to it through Cynthia Haven’s bookblog. I would be happy to do both. Thank you.